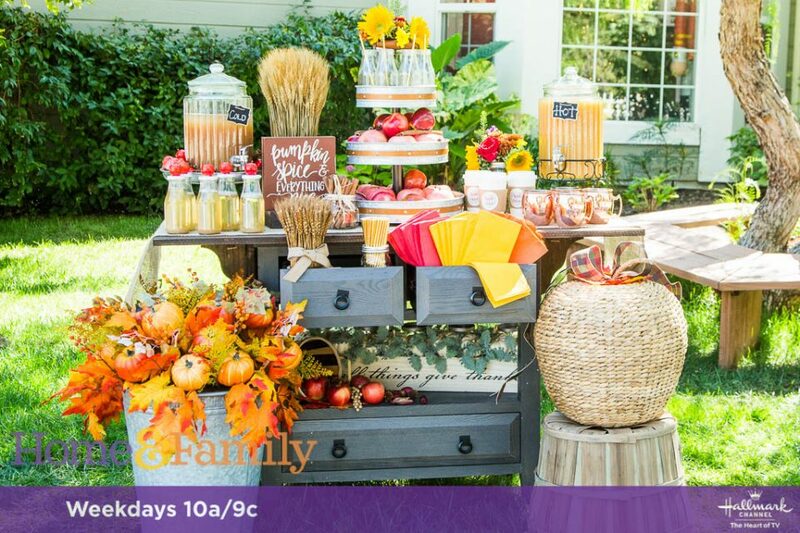 This week I’m soooo excited to team up with Maria to create a wonderful Autumn Apple Cider Station…well, I WAS really excited…then she went and had the greatest excuse ever…she went into labor! So while she is bringing a beautiful little human into this world, I’m taking the reins and will be tackling this DIY myself, with Maria’s inspiration and recipe guiding me along the way. Autumn is my favorite time of year, and my favorite time to decorate. As the air gets chillier, it’s so fun to wrap up in a warm blanket and enjoy some hot apple cider! But my hubby is always warm, so while I enjoy a hot beverage, he prefers a cold apple cider…so I’m incorporating both into an apple cider station. A wonderful apple cider recipe that you can find here! Measure the space that you have for your apple cider station. If you are doing it outside like us, then you can make it any size you would like! Take your table and measure the width. Take this measurement to your local hardware store and have them cut a piece of plywood to the width and the length of 48”. Add the corbels to the sides of your table with the hardware provided and your screwdriver. Decorate your table with all of your fun goodies! Add your mini apples to the tops of the glasses with hot glue. Use the drawers to hold extra items like straws, napkins, cinnamon sticks, etc. If you are under a tree like we are, make a sign for your apple cider station and hang it above your station. Following Maria’s recipe, put cold apple cider in one jug and hot in the other one. Enjoy your apple cider station! ou can use any type of table for the base of this station: an end table, a side table, a dresser, etc. You will be transforming it into a buffet table. Visit garage sales, swap meets and the discount center of furniture stores to find a good deal! By changing the décor, you can reuse this table for every season and every holiday.